Today we have some great deals for gaming at home and on the go alike. Whether you're in the market for your first 4K TV or want to get a second (or third or fourth), you'll like the price on this Toshiba set, and your phone battery will thank you for investing in a Mophie charger. 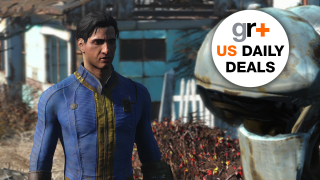 Read up on the US gaming deals below and stop back in tomorrow for more limited-time discounts. The 4K TV deals keep coming, and this time you can save a quarter of the cost on a budget-friendly model from Toshiba. At 42.5" it's a great "bedroom TV" size and at just $299 it's definitely within impulse range, at least for a new TV. Holiday travel is nearly upon us. If you want to play Pokemon Go or other battery-hungry mobile games away from a power outlet, you could really use a portable power source to keep your phone alive. Enter this $50-off deal on Mophie powerstation mini in various colors, each of which will boost your phone with a 2500 mAh capacity in a compact package. Not bad for $9.99!